The popular Clarendon Street bike route through East Melbourne from the MCG to Albert Street will be disrupted from the middle of next week. 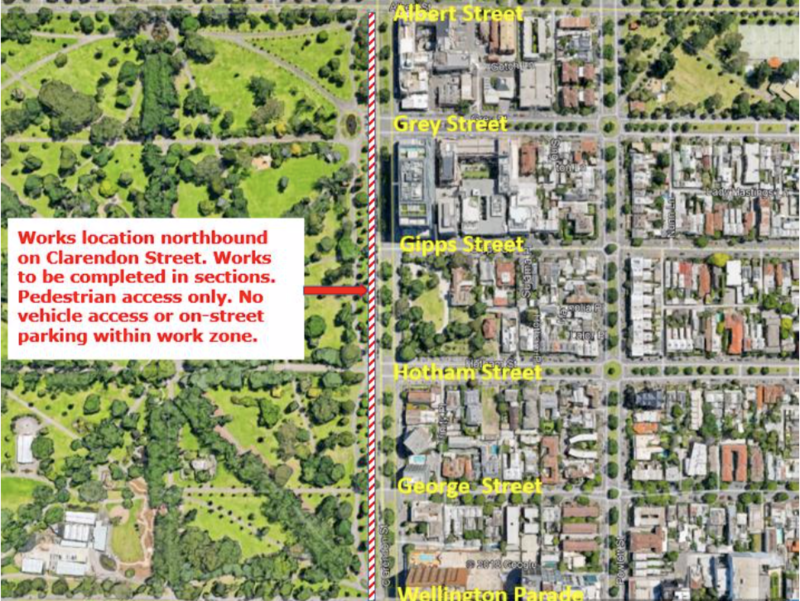 The new M41 water main is being installed down the west side of Clarendon Street, next to the Fitzroy Gardens. This means there will be no north-bound traffic on Clarendon. We understand north-bound bikes are to be detoured along the Wellington Parade shared path and up Lansdowne Street. The works are expected to be completed in about 10 weeks. For drivers, there will be no access to parking bays on Albert Street and Clarendon Street within the work zone during the works. Pedestrian access will remain in place. As a result of these temporary road closures and detours, there will be limited parking available in neighbouring streets for both local residents and businesses. Drivers hunting for parking can be a hazard. Bikes heading south bond on Clarendon Street should take extra care. Once the works are completed, be aware that the first re-surfacing of the road will be temporary. The proper re-sheet will happen later. A map of the Clarendon Street work zone.